NORTHBOROUGH – The Algonquin Regional boys and girls basketball teams squared off against their Westborough counterparts in a classic local rivalry doubleheader on Friday evening, January 11. 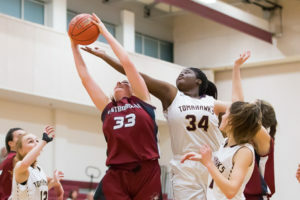 In the first game of the evening, the Algonquin girls defeated Westborough 54-28. Algonquin captain Emily Genga was the game’s top scorer with 17 points. Alexa Vassilakas, who sank 8 of 10 free throws, scored 12 for Westborough. 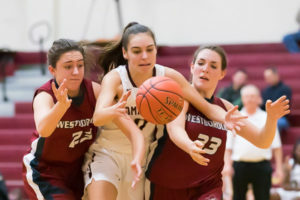 The Algonquin girls improved to 2-7 on the season while Westborough fell to 3-5. 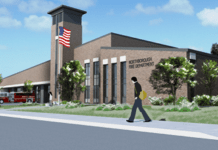 In the nightcap, the Algonquin boys defeated Westborough 74-56. Nick Redden scored 32 for Algonquin while freshman Alex Karaban added 27. 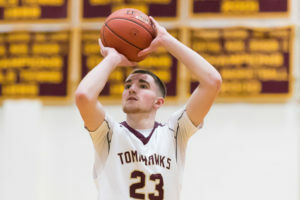 Matt Doherty was Westborough’s top scorer with 17 points. 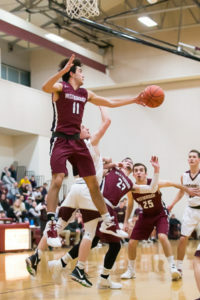 The Algonquin boys improved to 8-2 on the season while Westborough fell to 7-2. Algonquin’s Emily Genga is sandwiched between Westborough’s Grace Burns and Annie Beckman as they scramble for a loose ball. Westborough senior Quinn Donovan flies thru the air as he blocks an Algonquin shot. Algonquin captain Nick Redden has his eyes on the basket as he sinks a free throw in a game against Westborough.